The Alexa Family from the left: Tap, Fire TV, Echo and Echo Dot. Since its release, Amazon’s Echo has consistently been one of the site’s top sellers in electronics, in large part thanks to Alexa, Amazon's virtual personal assistant. Today, Amazon announced two products that change up how you can access Alexa, the cloud-based personal assistant: the Echo Dot and the Amazon Tap. 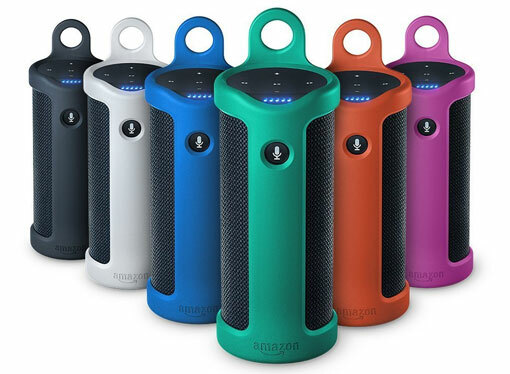 The Amazon Tap (pre-order now for $129.99, available March 31, 2016) is a hybrid between a portable speaker and the Amazon Echo that packs a lot of audio power. 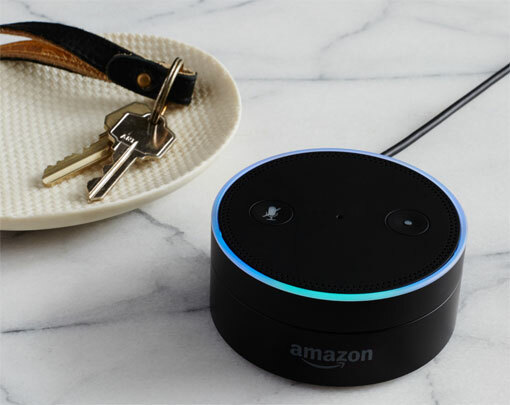 One of the disadvantages of the Echo is that it’s tied to an outlet, but no more: To use cloud-based Alexa out in the wild, you can either connect to Wi-Fi or tether the Amazon Tap to your phone’s hotspot. Unlike the Echo, the Tap isn't always listening for you to issue a command. You have to tap its microphone button to ask Alexa to do something, hence the name. The Tap has two 1.5-inch drivers and two passive radiators that deliver 360-degree audio and more bass than the Echo. So listening to Spotify or Pandora or any of the other Alexa-supported music streaming services just became even better. Included is a charging cradle that provides cordless power for up to nine hours. To protect the Tap, Amazon is also selling a protective case/carrier called Sling (pre-order now for $19.99, available March 31, 2016) that comes in white, black, blue, green, magenta and tangerine. The Echo Dot is essentially a tiny, less expensive version of the original Echo. The Echo Dot keeps the Echo’s circular shape and far-field voice recognition ability, but because its built-in speaker is small (and certainly doesn’t have a 2.5 inch woofer and 2.0 inch tweeter like the original Echo), it can connect to a higher quality speaker with a cord or through Bluetooth. Unfortunately, for now at least, only Amazon Prime members who already have an existing Echo or a Fire TV can order it by saying, “Alexa, order an Echo Dot.” Amazon is hoping the Echo Dot will serve as an addition to your Echo system for another part of the house, but if you’ve already got a speaker, it can absolutely serve as the primary Echo for the house. The Amazon Echo is available for $179.99 on Amazon (although as of March 3, it won’t be in stock again until March 12). The Amazon Tap is available for pre-order for $129.99 on Amazon, and will be released March 31. The Echo Dot costs $89.99 on Amazon (also being released on March 31, 2016), and is only available to Prime members and can only be purchased through Alexa on an Echo or a Fire TV. I ordered the Tap. Was extremely excited - I wanted something by my bed to tap, ask it to play my Audible book, take it with me to the bathroom (to listen while showering), and to carry around - all with a better sound than my phone alone. Well, I endured 4 days of trying to get it to work even remotely as I wanted… after 5 minutes of starting, pausing, starting, pausing, the Tap would finally start my book - and NOT ONCE did it pick up where I had left off. I tried “resume Audible book”, “pick up Audible book where it left off” and a bunch of other commands that really aren’t for mixed company! Once, I started a whole new book in Audible (while at work) - and when I got home and asked Alexa to read… it started reading the book I had already finished. With about an hour left in the book. Really? And with Audible being part of the Amazon family, I thought it would all mesh together. I don’t listen to music much, so I didn’t care about that feature - but was happy to return it for a refund. I’ll just keep using my little bluetooth speaker - it at least plays where I had left off! Not worth it at all if you’re a book listener like me.